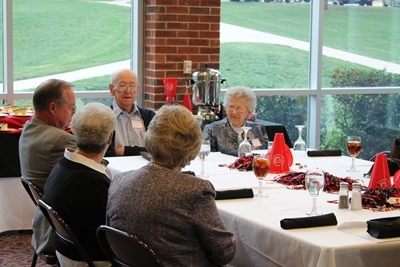 The 50 Year Club Luncheon on Friday was a success as 30 were in attendance and 12 from the class of 1962 were inducted into the club. Later that night, everyone got dressed in their best for the Homecoming Banquet where chicken in a creamy lemon, or pesto sauce and the chocolate fondue were enjoyed by everyone. 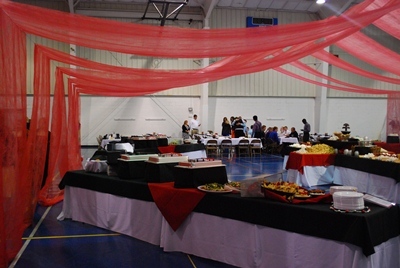 A fun photo booth was available this year during the buffet-style banquet and was happily taken advantage of by many friends. 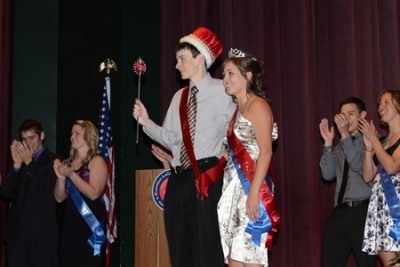 Christina Carter was crowned the 2012-2013 Homecoming Queen during the Homecoming Coronation on Friday evening, October 5, and Andy Krutsinger was named Homecoming King. Carter is a human services major from Center, MO, and Krutsinger is a public relations major from Chariton, IA. Other queen candidates were seniors Sarah Erickson from Bowling Green, MO; Rebekah Schwartz from Troy, MO; and Jessa Hopke from Columbia, MO. King candidates were seniors Vu Van from Hanoi, Vietnam; Josh Rosentreter from Gillespie, IL; and Matt Leach from Germantown Hills, IL. This year’s Outstanding Young Alumnus Award went to Justin L. Gibson ‘08. Justin earned his business administration degree with an emphasis in finance in 2008. Since then he has obtained numerous insurance and securities licenses and is part owner and financial advisor with Benson Financial Group, Hannibal, MO. Justin is active with the Gideon’s, Early Bird Kiwanis, F.A.C.T., and he and his wife, Brooke Campbell Gibson ‘10, are members of Madison Park Christian Church, Quincy, IL. The Distinguished Alumnus Award went to Dr. Harlo Donelson ‘52. Harlo earned his associate of arts degree from Hannibal-LaGrange in 1952. He earned his doctorate of dental science from the Kansas City School of Dentistry in 1962. On September 24, 2012, Dr. Donelson celebrated his 50 year anniversary as a dentist in Memphis, MO. He is a member of a variety of organizations including, Chamber of Commerce, Rotary, and a member of Elder Presbyterian Church. He has one son and two granddaughters in Long Island, New York. After the awards, entertainment was provided by comedic magician Tim Gabrielson who inspired the audience to live well and keep it funny. Other Homecoming events included a fun run, president’s reception, alumni art exhibit, alumni athletic events, a cross country meet and men’s and women’s soccer games. The Trojans competed well this weekend as both the men’s and women’s soccer teams defeated opponents Lyon College. The men’s and women’s cross country teams also came away with a victory during their Trojan Invitational Saturday morning. Sunday morning the events wrapped up with a worship service on campus led by HLGU’s Praise Song and a message given by Dr. Jeff Brown ’94, Director of Campus Ministries and Associate Professor of Christian Studies. Next year, Homecoming is scheduled for Friday, October 4 through Sunday, October 6.